A resource for film students, and lovers of alternative and indie cinema. The term ‘mise-en-scene’ is used to “signify the director’s control over what appears in the film frame” (1) and covers such elements as setting, lighting, costume and the movement and actions of figures appearing within the film. The iconic Citizen Kane (Welles, 1941), a biopic that traces the life of fictional newspaper magnate Charles Kane, uses the elements of mise-en-scene to reinforce ‘loss’ as a recurring theme throughout the film. As a faceless reporter goes about collecting personal recounts of Kane, the stories told suggest that throughout the majority of his life, Kane was “moving inevitably toward [an inner state of] bitterness, disappointment and loss” (2). The first flashback scene shown (set at Kane’s childhood home) begins Kane on this aforementioned negative emotional journey. 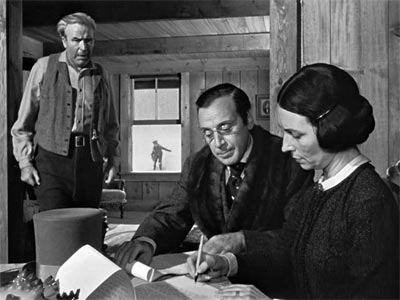 Kane is shown in the background of the scene, while in the foreground, his parents and Mr. Thatcher discuss his future. Kane appears visually trapped within the frames of a window, echoing the way in which he is being ‘trapped’ into Mr. Thatcher’s guardianship. During this scene, a close up of Kane’s indignant expression fades out slowly to reveal the sleigh he happily played with moments before. Having unwillingly left his simplistic home for the riches and supposedly assured success Thatcher can offer him, the sleigh is all that remains, shown abandoned in the foreground, covered in snow. Snow in itself bears “connotations both of burying [the past] and freezing [this idealised memory in Kane’s mind]” (3). Kane is never again shown against a pure white background, suggesting that his childhood (and implicitly his innocence) was wrested from his in this instant, left behind him with his sleigh, all for the sake of trying to guarantee that Kane’s future is a ‘successful’ one. Although Thatcher later gives Kane another sleigh, it is too late; Kane’s defiant rejection of the sleigh demonstrates the way in which it is not so much the sleigh, but his previous childhood happiness that he longs for. Kane forever onwards appears to harbour a longing for the ‘frozen’ memory of his lost, though most likely idealised childhood. This is suggested by his gasping of “Rosebud” (referring to his much loved sleigh, and essentially, his much missed childhood) at the films beginning. The theme of loss within Citizen Kane is also shown through his loss of personal relationships, in exchange for what he is taught to perceive as success. His lonely death shows the sad turn that his life has clearly taken, however, the loss of other personal relationships are traced throughout Kane. Although Kane and his first wife Emily’s relationship is initially depicted as being quite loving and tender, the scenes that follow their blissful courtship demonstrate the loss of such feelings. Their emotional separation is made apparent by the increasingly terse and stilted dialogue the once happy couple share. The tone of their voices become hardened towards each other, and the amount of words they exchange on a daily basis dwindles. The unsettling, almost unnatural stillness of the final scene they appear in together, set amongst an elegant dining setting, appears more as a staged theatre scene than a cozy domestic meal. This suggests to the viewer the way in which Kane and Emily, in their later years, merely played roles in a marriage that no longer satisfied either party. After Kane’s eventual loss of his newspaper, the loss of his close friendship with Leland, the loss of the election for the Governor of New York and the demise of both of his marital relationships Kane is left utterly alone. Footage from the ‘News on the March’ montage showing a wheelchair bound Kane affirms the loneliness felt in his later years. This feeling of loneliness is perfectly captured by the deliberate poor quality of the footage; that and the unsteady way in which it is shot suggests that he is no longer a man important enough to deserve the solid focus he previously enjoyed. Cowie, Peter, 1973,’The Study of a colossus: Citizen Kane,’ A ribbon of dreams: The Cinema of Orson Welles, A.S Barnes and Company, Cranbury, 32. Gianetti, Louis, 1990, ‘Chapter 2: Mise en scene’, Understanding movies, 5th ed., Prentice Hall, New Jersey. 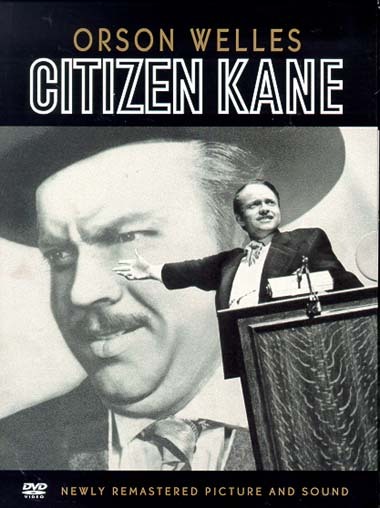 Lebo, Harlan, 1990, Citizen Kane: the fiftieth-anniversary album, Doubleday, New York.